Let's talk teamwork: How do behavioural scientists work together with computer scientists and system architects? 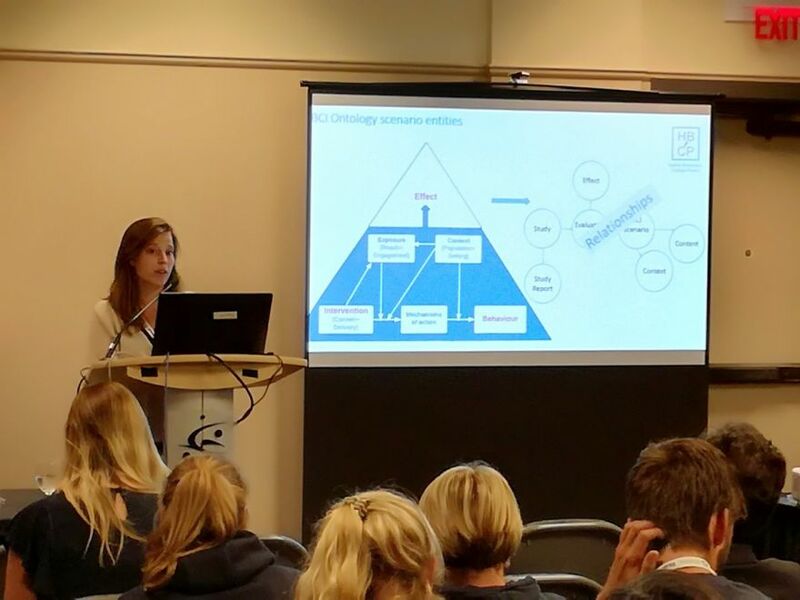 This is a question Marta Marques, Research Associate of the Human Behaviour-Change Project (HBCP) posed recently when representing the project as a guest speaker at the e-&m-health Special Interest Group (SIG) meeting as part of the annual ￼International Society of Behavioural Nutrition and Physical Activity (ISBNPA)￼ conference in Canada on 8 June. Marta's talk brought together experts in behavioural science, health and software development all wanting to hear more about the HBCP and debate the challenges faced when working on a multi-disciplinary project, and to explore potential solutions. The e-&m-health meeting began with Marta’s presentation on the HBCP followed by the showcase of a range of mobile apps and websites targeting healthy behaviours, developed by group members. Apps developed by the group were displayed at stations around the room allowing attendees to test them out. This engaging, interactive format attracted a large and multi-disciplinary audience of experts in behavioural science, health and software development. Marta’s presentation included an overview of the HBCP and shared the practicalities of applying artificial intelligence to behavioural science. She posed key questions related to the development and implementation of the HBCP, such as: What is the daily work of the behavioural science team? What have the team done and what have they learned so far? What are the main challenges the team face? How do behavioural scientists work together with computer scientists and system architects to achieve the HBCP aims? What is needed to carry out such a project? It was followed by a lively Q&A session, illustrating the substantial interest of the research community in the opportunities offered by the HBCP (and its challenges! ).